Rune Eriksen is a well-traveled gentleman of metal. He was an important part of Mayhem‘s second creative wave and continues to be a foundational part of Aura Noir. He’s also known for his gothic doom vehicle Ava Inferi, which released one of the most enduring albums in the genre with 2011s Onyx. Now he’s launching another project with long-time Ava Inferi collaborator Carmen Susana Simoes. 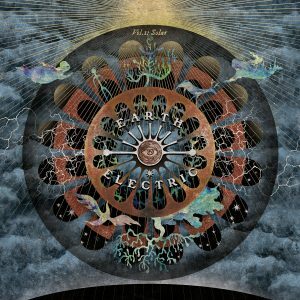 Earth Electric could be called experimental goth rock, and rocking it is, taking an enormous 70s rock influence and shoehorning it into Ava Inferi‘s ethereal goth style. This thing is dangerously overflowing with Deep Purple riffs and Hammond organ swells and as you might imagine, that means it’s encroaching on the hallowed grounds of occult rockers, Ghost. But where the masked muppets are all about slick, poppy writing, Earth Electric let their creative freak flag fly and worry much less about accessibility and immediacy. The result is a weird, at times chaotic jumble of ideas, genres and eras that don’t always coexist well and often actively fight against one another. Opener “Mountains and Conquerors (Pt. 2)” comes out of the gate with urgent riffing suitable for an Dio solo album, setting the stage for a big stadium rock anthem. But instead of a hard rock snarler or even a Papa-approved crooner, Carmen Simoes shows up with her soft, haunting dove coos. While I dearly love her voice, she sounds tragically out-of-place set against rocked out riffs and thunderous drums, and the two radically different components struggle against each other mightily, though the song itself is solid. This is the lead story of the album, as Rune attempts to fuse angelic vocals with edgy, often rowdy hard rock. The fit works somewhat better on “The Endless Road” with its more laid back approach giving Carmen more room to weave her hypnotic spell. “The Great Vast” sounds the most like a Ghost song and works for that very reason, but the odd, clicky bass sound had me actually looking around the room for the source of the noise. “Meditate Meditate” is an awkward stew of musical ideas but things finally seem to come together for reasons I cannot pinpoint. 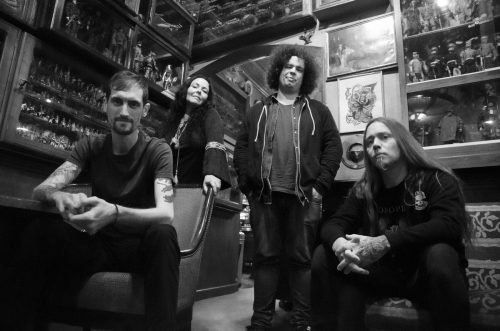 The hard rock still chafes and rubs against the soothing vocals in uncomfortable ways, but here it produces a useful tension instead of chaotic mish-mash. This song hints at what could come from this concept and it’s a genuinely interesting tune. Sadly, the bulk of Solar can’t maintain this delicate balancing act. The title track starts strong with an energetic occult rock guitar line that carries through past the midway point, but then things run out of steam and the song limps to a weak conclusion. “Sabbatical Moons” is aptly named as its lead riff feels lifted from Sabbath‘s Never Say Die album, but the surrounding music is somewhat dull. The album winds out with a two minutes of joyous hippie chanting which adds less atmosphere than was likely intended and closes the show on a down note. Vol I: Solar is quite short at just over 33-minutes, but for whatever reason, it feels way longer, and not in a good way. While the band gets full points for creativity, this is a tough album to get into. It requires patience and attention for the music to gel and even then, it’s hit or miss. The clash of disparate music and vocal styles rarely resolves itself in favor of the listener and while there’s a wealth of interesting music, things all too often feel hectic and unfocused. With so much rocking music, you find yourself desperately wishing for a rock-ready singer to join the fray with a mighty Jornish roar or even a high-pitched Paul Stanley-esque, “How are you doing tonight?? !” It never comes and that leaves a mental bruise. For all her talent, Carmen Simoes is completely out of her element here, much as Russell Allen would be on a Dodecahedron album. The music itself is often quite good and with a more appropriate vocalist things could have been quite entertaining. Rune’s guitar-work is often tasty, mixing 70s rock with psychedelic elements, with occasional segueing into metal riffing. The keyboards courtesy of Dan Knight reek of Jon Lord and Deep Purple and they play an important part in Earth Electric‘s atmosphere and style. There’s ample talent on hand, but it’s the concept itself holding the band back from greater success. Vol I: Solar is an interesting concept that falls short of successful execution. Still, for more adventurous listeners and those who wish Ghost were more progressive, this may be exactly what Doctor Rockter ordered. Rune to improve.